For maintaining inside and outside of gouges and vee tools, the Flexcut SlipStrop consists of a complex moulding with two areas of leather and a bar of a specially developed honing compound (abrasive). 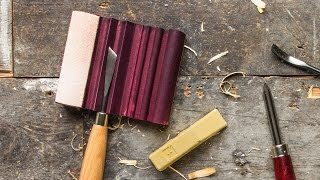 In use, the particular part of the moulding most suited to the chosen tool is rubbed crayon-like with compound and the tool stropped. A mirror finish is achieved quickly, and the resulting razor edge can be maintained by repeating the process many times before resharpening is required. 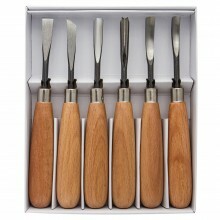 Use for gouges and vee tools both inside and outside. View PDF Sharpening your tools with Flexcut SlipStrop. Essential for keeping tools sharp.